LANSDOWNE, Va. (November 9, 2017) — Colleges can dramatically increase the odds of success for students with financial need by changing their financial aid practices, according to a new report from the Jack Kent Cooke Foundation. 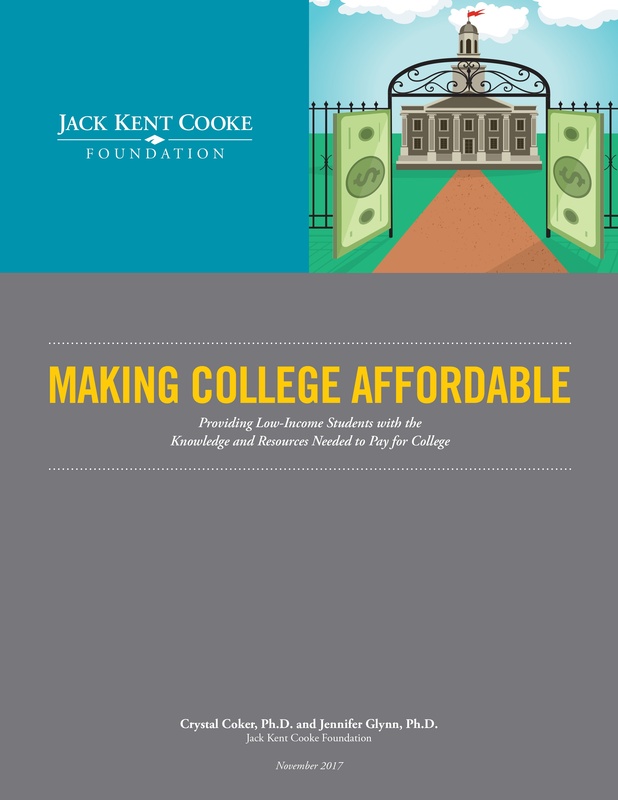 The report, titled “Making College Affordable,” examines the numerous barriers preventing low-income students from enrolling and persisting in college. These barriers include concerns over high tuition and fees, lack of clarity on award amounts and duration, and a limited understanding of how financial aid works. According to the report, widespread university practices such as the shift towards merit-based scholarships may actually exacerbate barriers by limiting available aid to low-income students who need it the most. Lack of understandable information in financial aid award letters also puts low-income students at a disadvantage because students may incorrectly conclude that a college education is unattainable — or enter college without a full understanding of how to manage costs, and ultimately drop out. The report outlines 11 best practices that colleges and universities should implement to help low-income students finance their college education. The strategies are organized into three categories: clarifying financial information, easing the financial burden, and filling in financial aid gaps. By implementing the strategies, schools can provide students with better information to make more informed choices, make going to college more affordable, and help students maximize the aid they receive.